Onychophagia (nail-biting) is a common disorder affecting 20%–30% of the general population. However, its prevalence is likely underestimated, as patients are often embarrassed to seek help from physicians. It is not difficult to spot a nail-biter. Clinically, the nail will appear abnormally short and uneven. Cuticles may be absent or ragged and nail folds may be in varying stages of healing. Splinter hemorrhages (longitudinal thin black lines that look like splinters) are often present within the nail plate. Although the exact cause of onychophagia is currently unknown, there are studies that show a possible genetic relationship. There is also a possible association between nail-biting and certain psychiatric disorders — such as anxiety and obsessive-compulsive disorder — however these studies have shown conflicting results. Nail-biting has also been associated with boredom or a lull in activity. 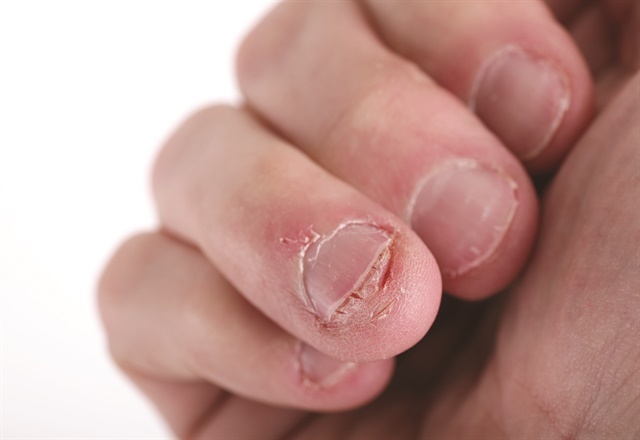 Beyond resulting in unattractive nails, nail-biting can also lead to a host of health-related concerns and complications. 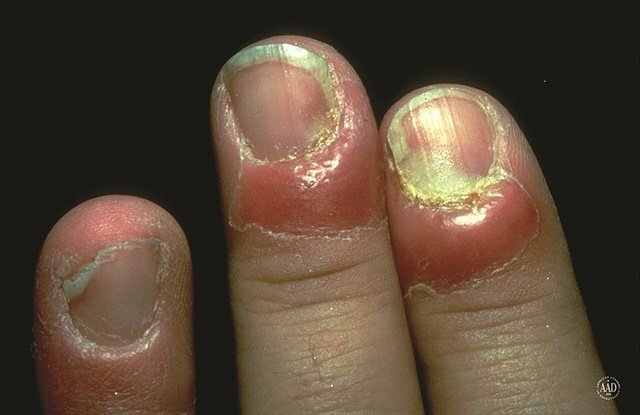 Longitudinal melanonychia (lengthwise pigmented bands in the nail) can occur from inadvertent stimulation of the melanocytes (melanin-producing cells) that reside in the lunula (half-moon region) of the nail. Those who bite or tear at hangnails near the cuticle are at risk for this clinical scenario. These pigmented stripes are almost always benign and do not pose a risk for nail melanoma; however, they are often cosmetically concerning to those who develop them. Paronychia is another concern associated with nail-biting. Paronychia is an infection of the nail fold that occurs when the cuticle is compromised. Disruption of the cuticle barrier can create an entry point for organisms to penetrate the nail unit. If bacteria enter, there will be pain, swelling, and purulent buildup that needs to be expressed, cultured, and treated by a physician. Alternatively, yeast organisms that are easily transferred from the mouth can take up residence and cause swelling and redness around the nail, eventually affecting the nail’s appearance. The nail may become bumpy with white patches and undulations. Herpetic whitlow is another nail-biting related negative outcome. When herpes virus of the mouth transfers to the finger, red blister-like vesicles may appear on the finger. This contagious infection is often extremely painful. Note that other viruses, such as warts, can spread this way as well. Dental complications can also occur from nail-biting. According to the American Dental Association, children or adults who bite their nails could crack, chip, or wear down their front teeth from the stress caused by biting. Let’s not forget the common cold! While exposing your fingers to the bacteria in the oral cavity is not ideal, spreading viruses and bacteria from your hands to your mouth can cause common infections like colds and viruses. The good news is that there are many successful approaches to the treatment of bitten nails. Discussing habits can be a sensitive undertaking and one that may be best handled by a medical professional. When there is a psychological component, such as severe anxiety or obsessive-compulsive tendencies, the client should be treated by a therapist and/or a psychiatrist. Habit reversal is a method of habit cessation that encompasses awareness of the nail-biting activity, recognition of warning signs, and development of a distracting competing response such as a stress ball, fidget cube or spinner, or rubber band. While this may sound straightforward, many nail-biters are not fully aware of when they are most prone to biting. For this reason, I have my patients keep a diary for several days in order to try to better understand behavioral patterns, triggers, and high-risk times and environments so that they can have a competing response in the ready. Bitter nail lacquers contain the unpleasant-tasting compounds denatonium benzoate and sucrose octaacetate, and are available over the counter. The lacquer is applied to the nails in an effort to create a very undesirable taste when bitten. If nail-biting is a common issue in your salon, consider offering these products to your clients. Some nail-biters find that utilizing a non-removable reminder such as a wristband can serve as a prompt to stop biting the nails. I had one patient who bit his nails when he was in his car stuck in traffic. He put a photo of his kids on the dashboard to remind himself that he didn’t want his kids to develop the same habit and it was highly beneficial for him. Nail technicians have one of the most effective nail-biting cessation methods at their fingertips — gel manicures! For patients who don’t have any active infections and for whom the appearance of their nails is a priority, I often discuss the idea of getting serial gel manicures. Gels are advantageous because they can’t easily be picked off and are long-lasting. Additionally, when clients take the effort to make an appointment, and spend the time and money, they are often highly invested and motivated to achieve a successful result. Usually, if a patient can refrain from biting for 12 consecutive weeks, they have effectively overcome the habit. Today we are all living in a “hand-held world” where we are attached to our mobile devices at all times. Now more than ever, the focus is on the hand and nails. Nail-biters can feel frustrated, embarrassed, ashamed, and overwhelmed by their habit. Astute physicians and nail technicians can provide many effective tools and resources for these clients. Dermatologists treat skin, hair, and nails. 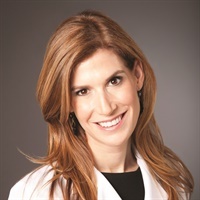 I am a board-certified dermatologist and I specialize in the treatment of nail disorders including nail infections, inflammatory diseases of the nail, cosmetic issues related to the nail, cancers of the nail, and sports-related nail injuries.